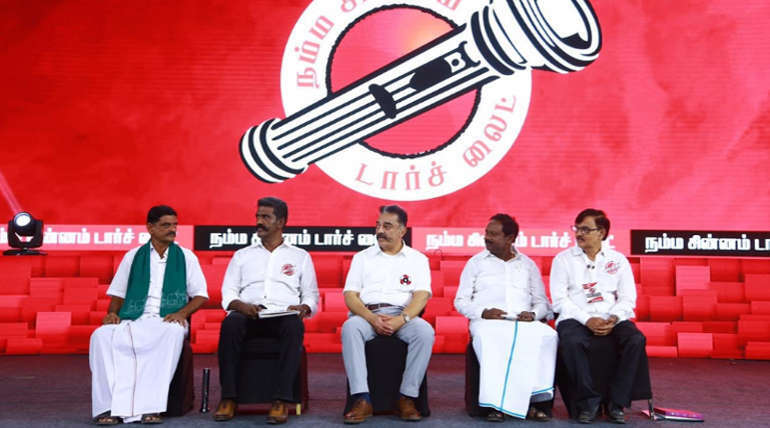 Kamal Haasan introduced the second-tier candidates in the massive public rally held at the Coimbatore Codissia Ground in the name of the "Introductory Meet and Change of the Candidates", released a parliamentary election legislation on Makkal Needhi Maiam. Kamal Haasan, leader of Makkal Needhi Maiam, declared candidates for 21 parliamentary constituencies, including Puducherry. The expectation that Kamal Hassan is going to contest in the constituency has been arranged among the Makkal Needhi Maiam, the candidates in the Coimbatore organized the opening ceremony. Kamal Hassan, who gave the entry through the platform that was divided between the masses, hosted the party's flag in the midst of the applause of the people. Then the ceremony started. 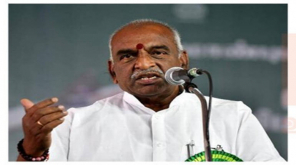 Speaking on the occasion, Mahendran, vice chairman of the party, said, "Many things are known for the Kongu region. This new political change starts from here. We are going to start with the slogan that the Corruption parties should go out. Those who do not fulfill their promises should also leave. Some think of the Kongu region as their stronghold. Therefore, from here we have to start a change. Those who claim to be big parties compete in 20 seats. But we have put candidates in 40 constituencies. In the midterm election, we have fielded 18 candidates. The change is going on." Finally, Kamal Haasan issued a video of DMK,Congress,BJP,ADMK saying, "This should not be forgotten by people. You have to ask the question. If you do not ask the question, I will be asking questions over and over again, if you do not work properly, you do not have to wait five years to eliminate them when people have been successful. A group of people from the side, a team from the delegates and I will meet. If the crime is proven, their resignation letter will come to you. The winner was the first signature that they wished to make that promise." Continuing, "Clean water supply for every home is provided in five years and the water price will be eliminated. 50 lakhs job opportunities will create in five years. We will remove the poverty of 60 lakh families below the poverty line. Home for everyone and plans to give importance to agriculture and industry to accelerate the overall economic growth of Tamil Nadu. Women will be given equal wages in all sectors including agriculture. 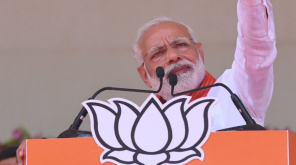 The seven pledges of federalism, women and children's welfare, agriculture, and public interest were announced by seven prominent ministries, which will further strengthen the Lokpal Bill Against Corruption and appoint the Lok Ayukta Officers." Subsequently, he published a list of candidates for the second phase. Kanchipuram M. Thangaraj, Thiruvannamalai R.Arul, Arani V.Shaji, Kallakurichchi H. Ganesh, Namakkal R.Thangavelu, Erode Saravanakumar, Ramanathapuram J.Vijayabaskar, Karur Dr. Hariharan, Perambalur V.Aruluprakasam, Thanjavur Sampath Ramadoss, Sivagangai Snegan, Madurai M.Azhagar, South Chennai R.Rangarajan, Cuddalore V. Annamalai, Virudhunagar V.Maniyasamy, Tenkasi K. Muneswaran, Tirupur VS Chandrakumar, Pollachi R.Mugambikai Rathinam, Coimbatore Dr. R.Magendran announced the candidates for the parliamentary constituencies. 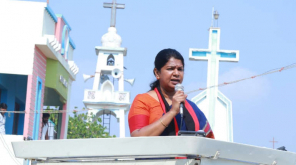 Subsequently, the candidate announced Poonamallee Poovai Jagathis, Perambur V. Priyadarshini, Tiruporur Karunakaran , Cholingar Malairajan, Gudiyatam Venkatesan, Ambur Nandagopal, Hosur Jayapal, Pappireddippatti M. Nalla Thambi, Aroor Kuppusamy, Nilakottai R. Chinna Durai,Periyakulam Urokapandian, Vaduthukulam Natarajan, Sriperumbudur Attorney Sridhar, Thuravurur Arun Chidambaram, Thanjavur Duriyarasan, Thanjavur Thuriyarasan, Manamadurai Ramakrishnan, Andipatti Thangavelu, Periyakulam Prabhu, Sattur Sundarraj. Kamal who announced the candidate, didn't announced himself in any the list. He said "I feel proud to carry the Litter rather than sitting inside it".